Do you like to peruse the thrift shops? Are you always finding antique steals on Craigslist or Ebay? Do you live for yard sale season and flea markets? Then this one-time blog hop is for you! The Best Treasure Find Ever blog hop will be going on from July 8th - July 14th (it will replace Memory Lane Friday on the 8th). To participate, just blog about your best thrifty find - and post a picture! Show off your incredible jewelry finds, a cute purse, a vintage desk or your 19th century copy of Paradise Lost. Then come here to link up and visit the blogs of other treasure hunters. The more the merrier, so I'd love if you'd help me promote this event by grabbing my button for your blog. To make things more fun, I will be picking one blog that links up by Random.org at the end of the week. 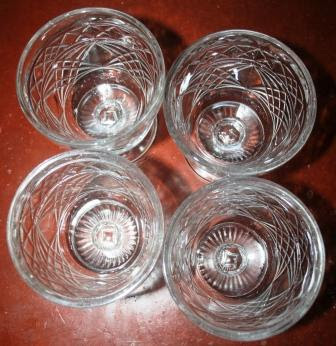 That blogger will win a set of 4 vintage glass peanut butter parfait dishes. These dishes are highly collectible and were how peanut butter was packaged back in the 50s. They are perfect for little summery parfaits and desserts! Special thanks to my Mom for donating these for the prize. To be eligible to win, you must link up to the blog hop the week of July 8-15 with a post about a treasure you have found. You must also display the "Best Treasure Find" button on either your side bar or the actual blog post. I will notify the winner by email and he/she will have 48 hours to respond before a new winner is chosen. I'm willing to ship anywhere! This should be a lot of fun, so get out treasure hunting! I will need to find a book about treasure hunting so I can do both your meme and mine at least once this summer. Oh, this looks like fun! I just discovered Memory Lane this past week. I didn't participate because I did a post yesterday for my best friend's birthday. But I plan to be here next Friday! And the Best Treasure Find should be very interesting! This does look like fun and I LOVE antiques, etc... Also love those little dishes. What a great idea!! Sounds wonderful. Oh, this looks like so much FUN! Count me in but I'll have to come back and do the necessary work; just not enough time right now. Have to go get Dave's meds and that's a half day trip. I can't wait! This is going to be so much fun!! How fun! LOVE those little dishes! I wonder why no one puts food in cute dishes anymore. 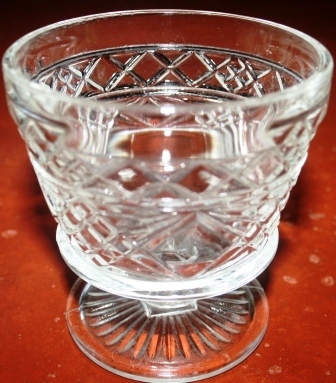 My grandma had snuff glasses LOL yep snuff came in them and then you had a drinking glass. Such cute things like that. I do have some drinking glasses with handles on them so they are kinda like a mug, that jelly comes in. LOL That company still does that. This sounds like fun, unfortunately I have the worst luck ever with this kind of thing!! My DIL has made amazing finds at Goodwill, yard sales, and Craig's List. Whole brand new outfits from Gymboree for two dollars!! Yet I can never find anything. LOVE your idea!! Can't wait!!! This sounds like a great give away. You are doing awesome on the fitness workouts. I am going to have to come back for your recap on Wednesday! Twenty-five miles running. Do you run 5 miles five times a week? Or more miles for fewer times? I think that's amazing! I didn't know that about peanut butter. I so wish they would still do that. Now practically everything is in plastic, which I really don't like. Sounds like a fun contest. We'll see if I can find something to tie in with a dessert blog. I would love to participate.